Since it was Splashie Boy's birthday on Friday, we did the celebrations during the weekend. I had to work on Friday night - loads of good Chinese food but unfortunately I couldn't bring him along. As Splashie Boy is a huge bovine fan, I knew it had to be Wagyu or Kobe beef for him. Since it was all about steaks, we decided to venture into a steakhouse vs a fine dining restaurant. 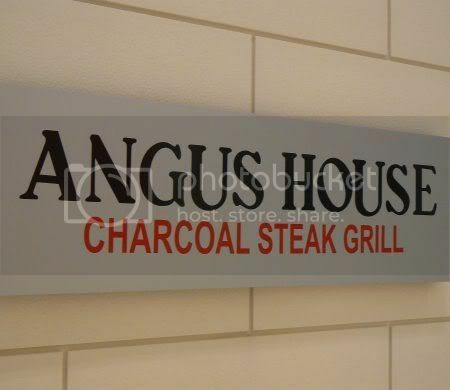 I had heard good things about Angus Steakhouse at Pavilion and decided we'll just give it a go. We were pleasantly surprised when we walked in, to find the steakhouse quite packed with people. There was even a Japanese family dining there. The atmosphere within the restaurant, reminds me a bit of a modernised Ship Steakhouse, something I grew up eating with my family with. Waiters wear tuxedos (looking like penguins) and waitresses wear these French maid getup with a frilly headgear. The menu is all about steaks - almost a full page dedicated to the various cuts and sizes available. You can choose from their sets, that are served with an appetizer, a choice of bread or rice, soup, salad, the entree and dessert. If you prefer ordering a la carte, they offer a selection of appetizers like oysters (fresh and baked), soups and grilled seafood items. There's also various types of pastas with pollack roe, abalone, beef bacon and etc. Splashie Boy's Birthday Wagyu - Moooooooooo! We both went for the sets, settling for 200g portions, as I couldn't decide on the various appetizers. Splashie Boy had the Wagyu Beef Tenderloin Set - marbling rating 9+, for RM240, while I settled for the 200g sirloin set for RM78. 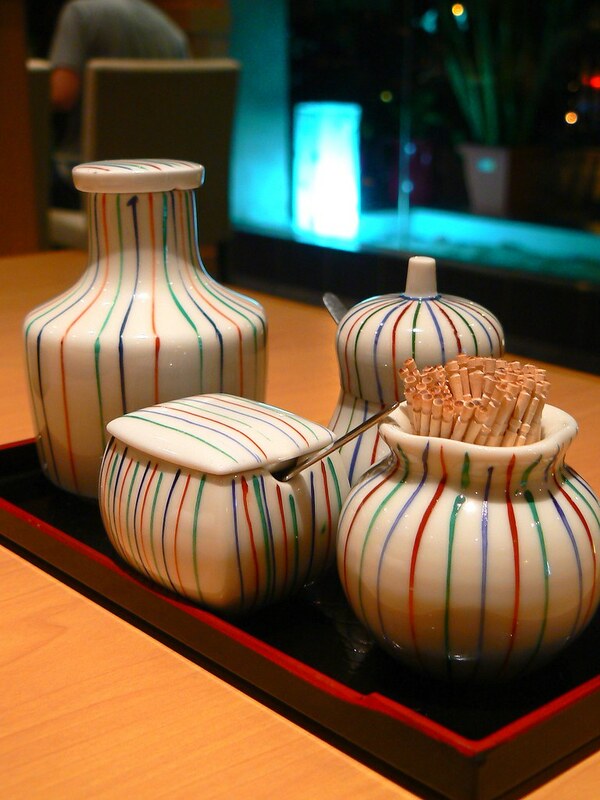 There is a sense of old style formalness to this place as the sets are served course by course. 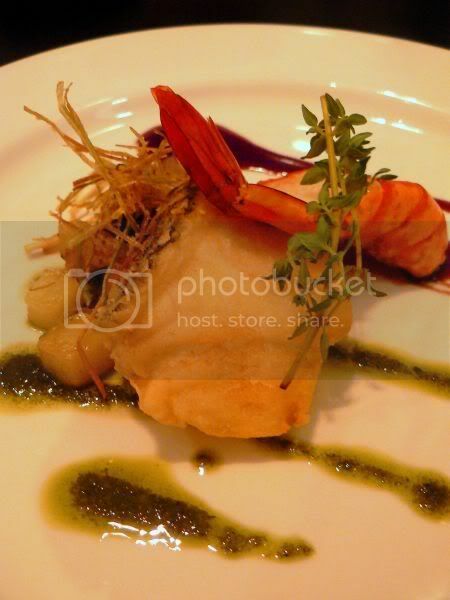 We started out with the appetizer - a pan fried cod and prawn served with a side portion of cubed potatoes and mushrooms. This changes, I guess with availability. We both loved the seafood, simple but tasty. 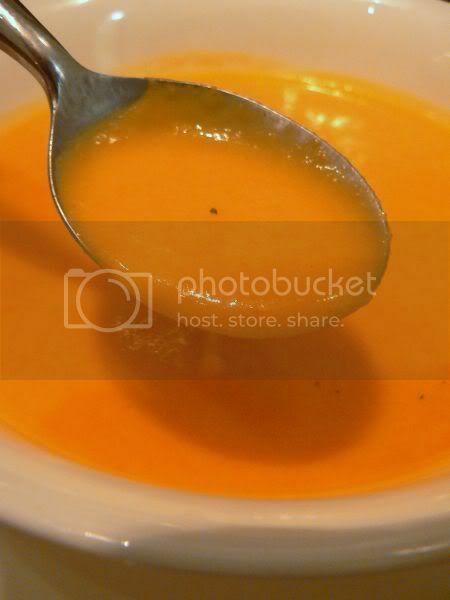 Next was a creamy carrot soup - thick and smooth. You get to taste a hint of the sweet carrots. 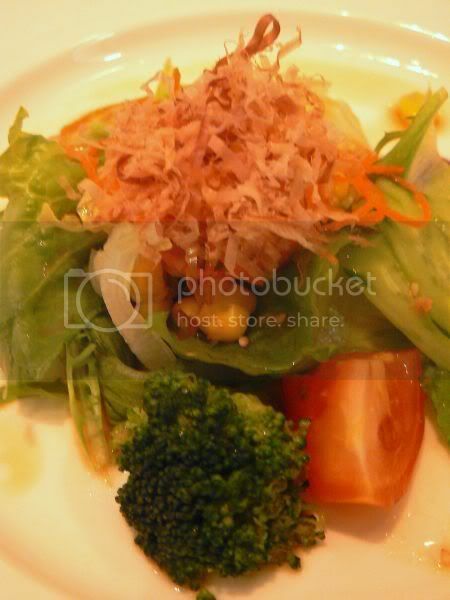 I loved the green salad they served - not very expensive greens, just plain green lettuce, broccoli, tomato and corn niblets but when combined with the Japanese dressing and a topping of bonito flakes, it was really good. 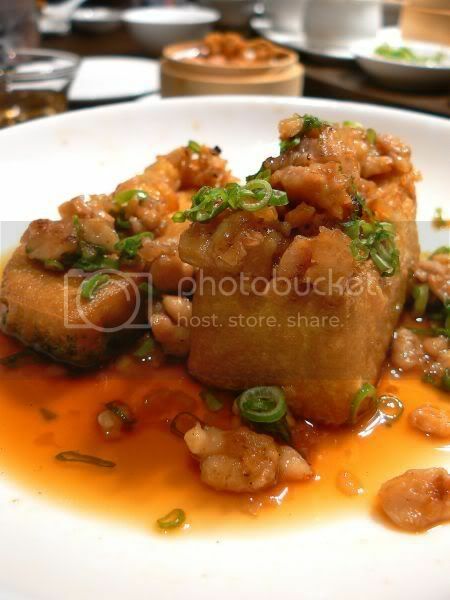 The dressing is unlike the typical wafu dressing with vinegar but was definitely made with shoyu (soy sauce). I finished my salad, feeling extremely satisfied. Then, it was time for the steaks to take centrestage. Charcoaled grilled in an open kitchen with a very powerful exhaust (I could see the chefs from a distant), the steaks are served on a brass sizzling plate, with a wooden base. Vegetables placed on the side, and should be eaten quite quicky as, if you leave them longer, they get cooked on the plate. My beef sirloin was super tender and juicy. I loved every teeny weeny bit of it down to the sinful bits of fat, I went for. If you don't want the fatty bits, ask for the tenderloin. Splashie Boy's Wagyu was very good. A thicker cut compared to mine, he was well satisfied. 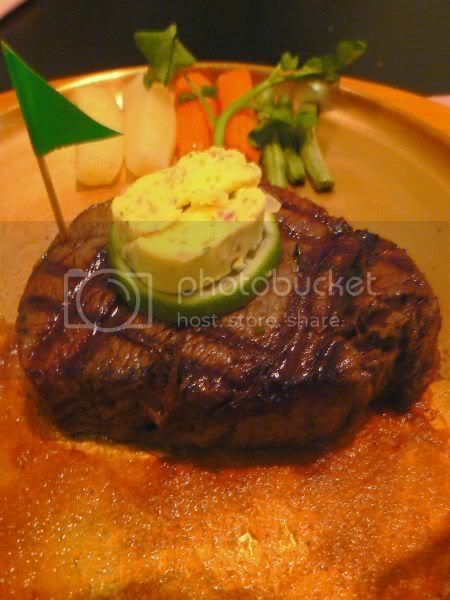 Each of the steaks are served with a slice of lime and a piece of herbed butter. Unlike steaks that come drenched with thick sauces, they serve their steaks with a sauce made from shoyu, finely minced radish and mirin. Incredibly good with the sauce that complements the taste of the beef and does not drown it out. I'm not too sure how they get their steaks to be so tender (I suspect some aging?) but whatever it is, Splashie Boy and I are hooked on it. 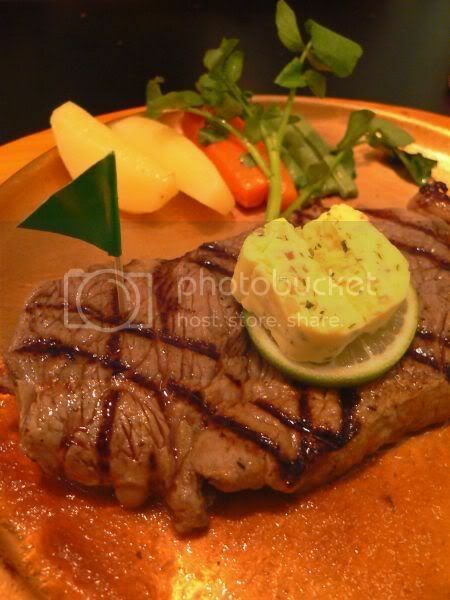 One weird thing was I asked for rice vs bread, and they served it with my steak and I was eating them together. Tasted good too, when combined especially with that special sauce they serve on the side. 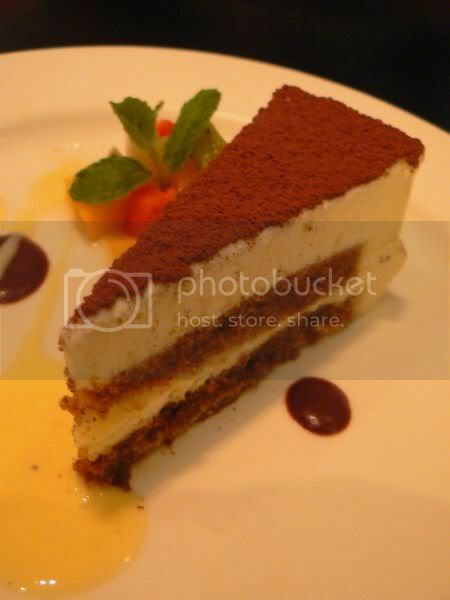 We ended with dessert - a slice of tiramisu, with creamy layers and soaked sponge cake. Not too overpowering sweet, each creamy layer was silky smooth. Despite the food being very good, I wasn't too impressed with the service. Maybe they were a bit busy that night but it took a while to get their attention. I also noticed, service starting going downhill after 9.30pm, as the staff was just eager to clear plates and go home, that they were doing all the service no-nos - reaching across the table from Splashie Boy's side to clear my plate or to serve me. Nevertheless, we'll still give them another chance and will definitely revisit, when we feel the urge for a good steak. Sighhhhhhh! It has been a long week since I blogged. As usual life got in the way i.e. things, which we can't plan for, like funerals and catching a flu. I'm still slowly getting over my flu bug. I did have a wave of good fortune yesterday, since I met Curtis Stone of Discovery Travel & Living's Take Home Chef. After chatting with him and seeing him in action, one can truly understand, why he was voted one of People magazine's sexiest men (with the likes of George Clooney) and why women are desperate to take him home. BUT I'm sure that is not what you tune in here for rite? Don't worry, I do have food and boy is it super yummy. A few weekends ago, I managed to persuade Splashie Boy to visit this place. I have been eyeing the fish head curry here for the longest time. Just didn't have the right quorum of people to attack one huge fish head, but since there was the 2 of us, I decided to go ahead. cholestrol but who cares, since they taste so gooooooood. Just round the corner from TMC, is this small little shack on the side of the road. Observe this place carefully as whenever you pass by it during lunch time, it is always packed. Always a good sign of how good the food is. Not everyone goes for the fish head curry as this stall's fried chicken, fish and sotong are equally good. Definitely cheaper than the fish head curry, you can get a decent meal for about RM4 to RM5 here with chicken, rice and a serving of bean sprouts on the side. I especially love the fried chicken here - juicy and crisp, while the fried sotong is also a must-have here for me. 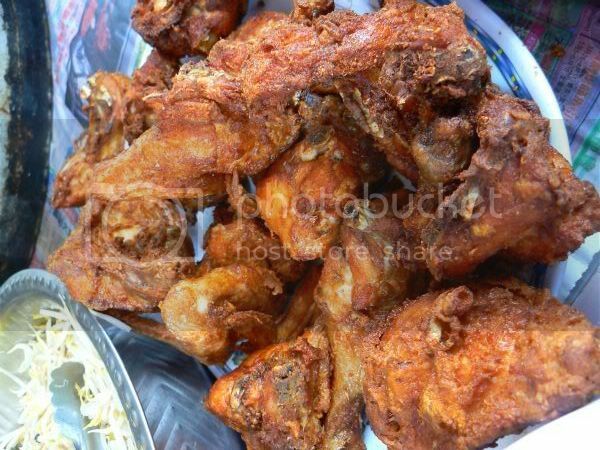 Not chewy like rubber, this stall's version is tender with a light crisp batter coating it. We went for the fish head curry, which ended up being super huge, as they couldn't dig out a small one from the pot. 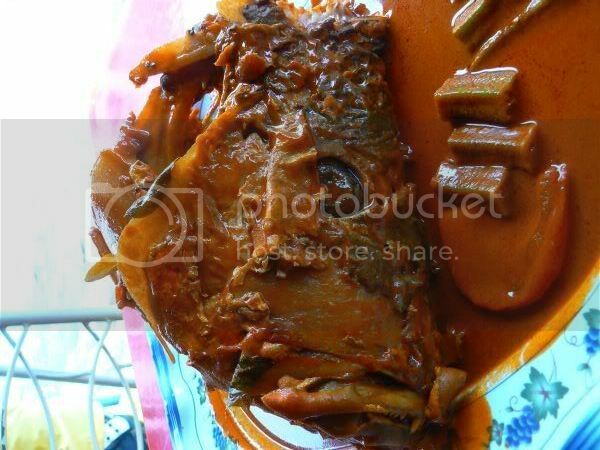 Now, if you have never eaten fish head curry, you must always try it with your fingers. It's a joy to dig around the fish head, searching through the bones for yummy flesh. Even though I'm a fish head fan, I tend not to go for the eye. Just can't get myself to eat that part. 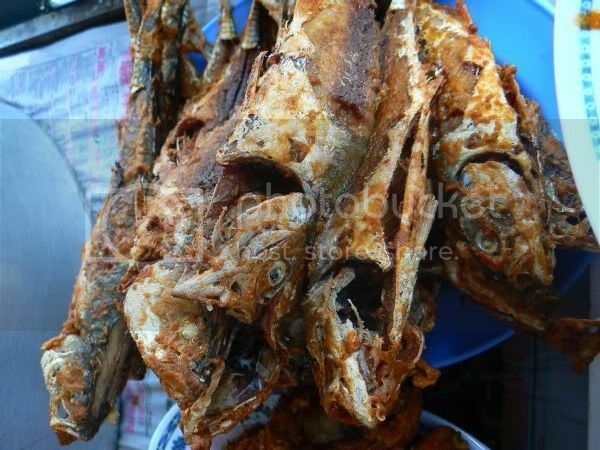 They use jenahak fish here - huge fellas as the heads are enormous. 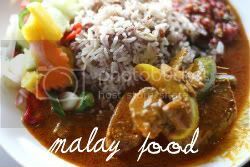 With a curry sauce that is slightly sour and not too spicy, this is excellent with a huge plate of piping hot rice. Do give it a try as it will be an experience, you won't forget. When it comes to food, I can be extremely relentless. Finding time to enjoy during weekends nowadays need to be slotted in between chores. Luckily we finished our chores early - many hands definitely make work seem lighter. I had read cumi & ciki's blog about the amazing lempeng, hence I knew that was what I wanted to do during my free time. We made our way down town and managed to find Haslam's easily, near Tawakal Hospital. The place was packed with people. Since parking was scarce, I went down to check, if they were serving lempeng. Spotted a man in front frying up parcels wrapped in banana leaf and a crowd of people surrounding him. Signalling to Splashie Boy, I told him to get a parking spot while I waited for the lempeng. It was a good move, as the lempeng was fast dissapearing off the greased hot plate. I planted myself firmly next to the waitress and kept relentlessly telling her, I wanted "dua lempeng, makan sini" i.e, "two pancakes, to eat here". I guess that gave me a trump card since I was eating there, as she doled me 2 pancakes ahead of this lady who was buying them to take home. Success at last, we got a table and both peeled off the banana leaf from the lempeng. After a quick photo session, it was time to dig in and boy! was it worth all that fighting for. 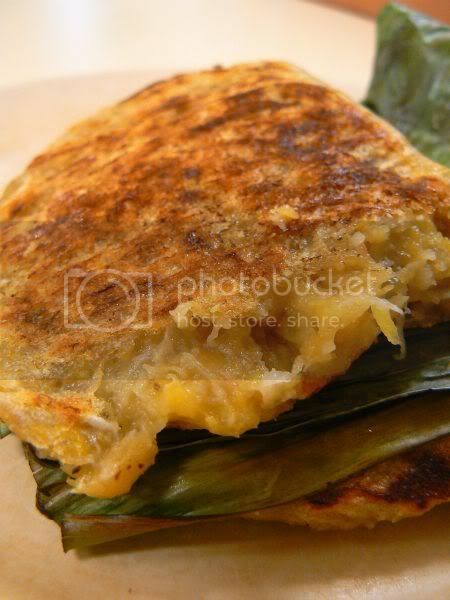 Similar to a pancake, this version was a soft concoction of smashed up bananas and freshly grated coconut. 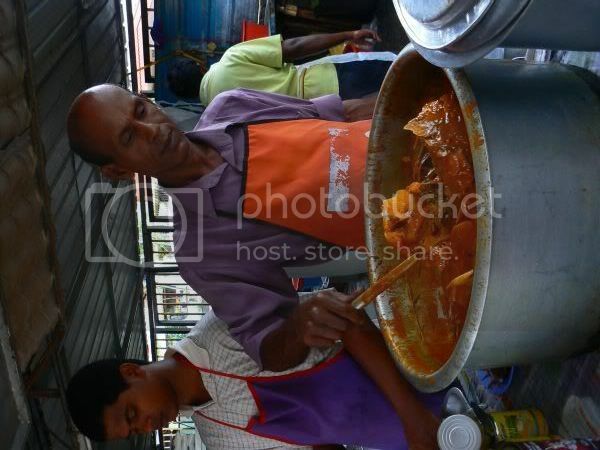 Eaten piping hot with a hint of a smoky banana leaf aroma, it was so delish, we could have had a few more. Unfortunately, there were none left. I asked the waiter what time they start selling, thinking I was too late in my mission - seems they do this daily, 2.30 pm. It was around 3.15pm, when I stood at the hot plate and they had sold out within 45 minutes. A quick glance at other tables and I knew why it had sold out so quickly as everyone dining there had a piece of lempeng on their table. 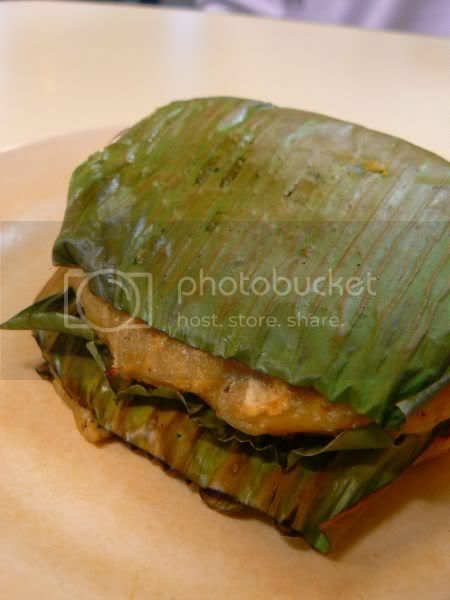 For the uninitiated, lempeng is essentially a Malay pancake. Usually eaten with a savoury item like curry, this was the sweet version. Really good stuff and the next time, I am around the area, this will definitely be my stopover at 2.30pm. Last Friday, I was feeling a tad depressed since I was working on Saturday! Feeling like a boost in my system, I suggested we try Japanese in Subang Jaya - an unexplored territory for me. Original intent was Shun, opposite Subang Jaya Medical Centre but there was a function at the nearby Sheraton Subang ballroom, which caused a mini traffic jam plus a shortage of carparks around the area. Changing tactics, we decided to check out the other Japanese places along the same row as Rakuzen. 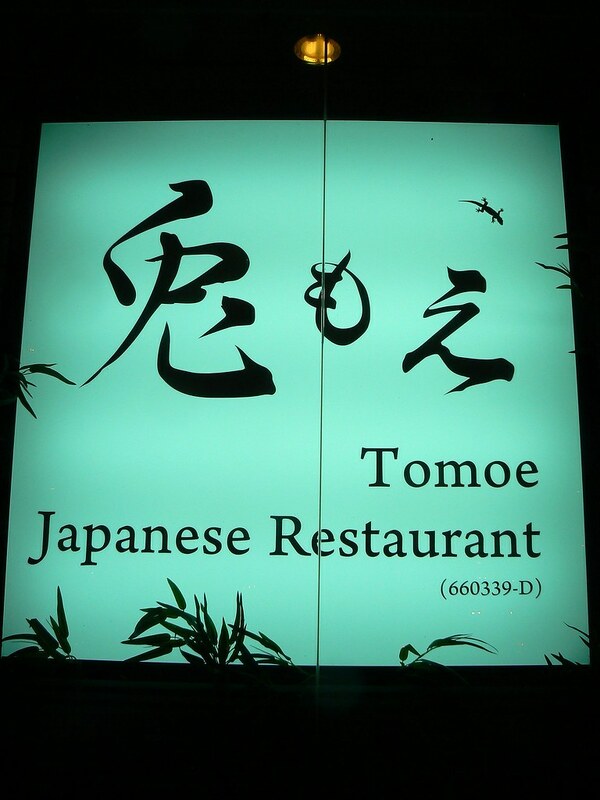 Passed by Hyotan which looked interesting but ended up at Tomoe, the corner restaurant as there was parking nearby. Tomoe also provides free jockey service, an excellent idea since this area lacks parking spaces. Since Splashie Boy is super sensitive when it comes to his car, he vetoed the idea of a valet. The place gave us a good vibe, as it was packed with people: locals and Japanese businessman out on the town, after a hard week of work. We ended up in the smoking section since no space was available in the other section. Luckily, no heavy smokers were around. Feeling lost with their menu, I decided to ask the waitress for recommendations. What's interesting to note is, there's no set dinners available. I now know they have set lunches per reading other blogs but no set dinner menu was presented to us. Instead, what we got was the weekly specials list and their regular menu, which we ended up ordering from. Throwing caution into the wind, we went for the waitress recommendations. 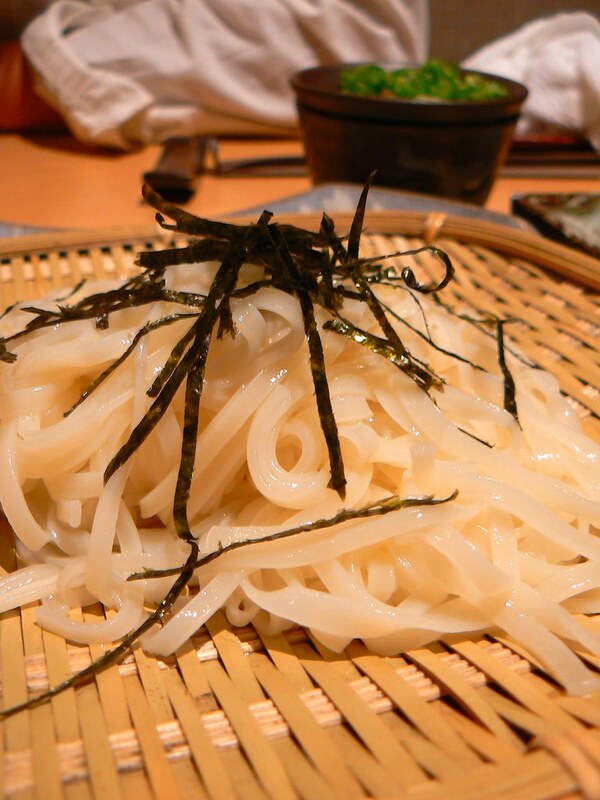 First, it was a seasonal vegetables with sesame sauce (Shiradatu Goma). However, it turned out to be more mushrooms vs seasonal vegetables. 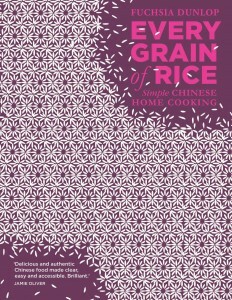 Luckily the sauce was good - creamy with a not too overpowering taste of sesame seeds. We both felt it was a rip off as that small bowl costed RM18. 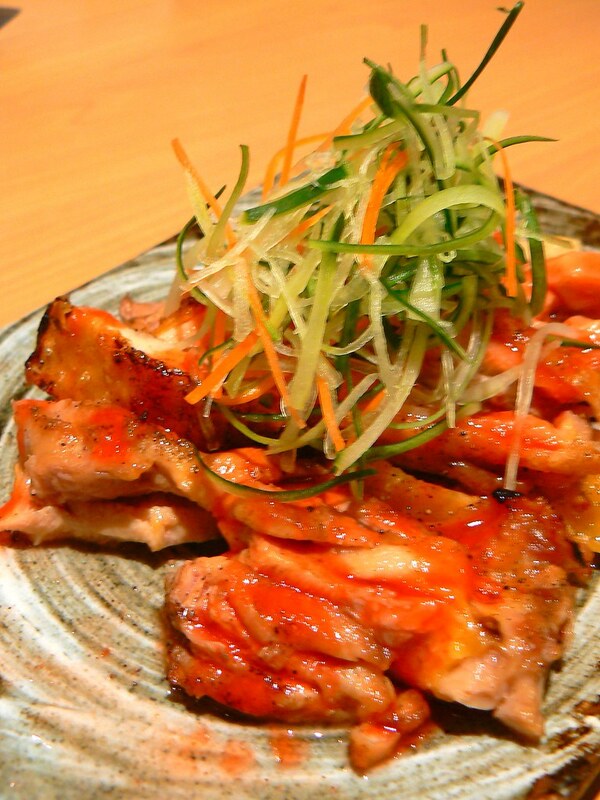 Next was the recommended grilled chicken with salt and plum sauce. 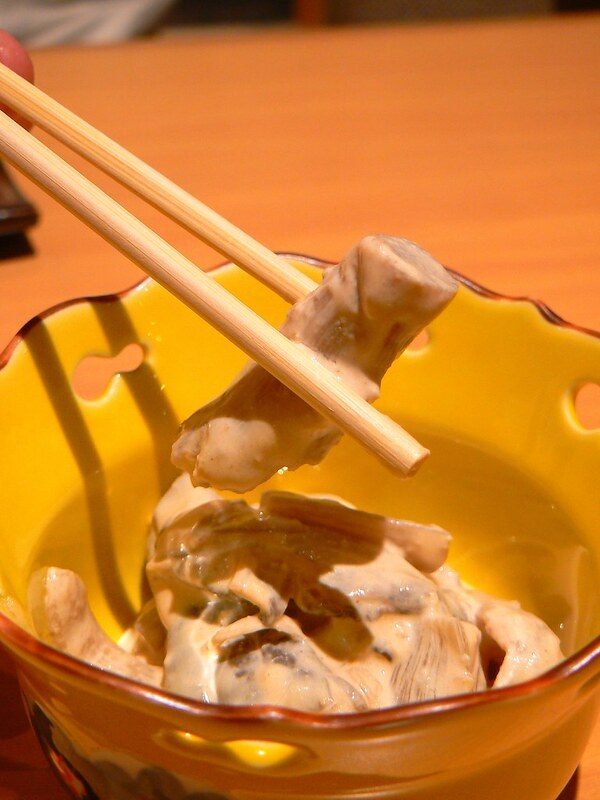 This was good - the chicken meat was tasty and again very fresh. 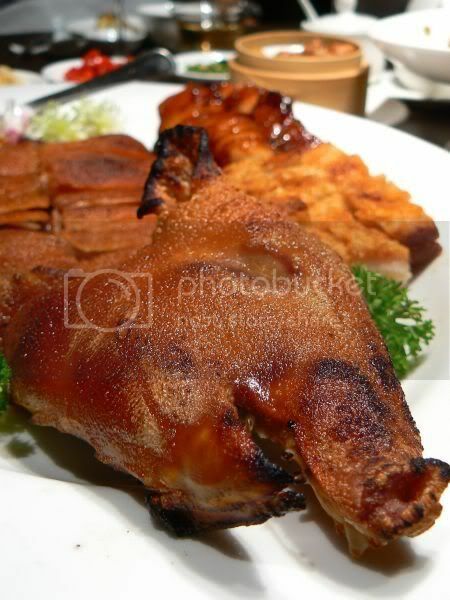 For those who prefer the soft antibiotic type of chicken meat, this is not for them as this chicken had a bite to it - imagine choi yuen kai (free range chicken). 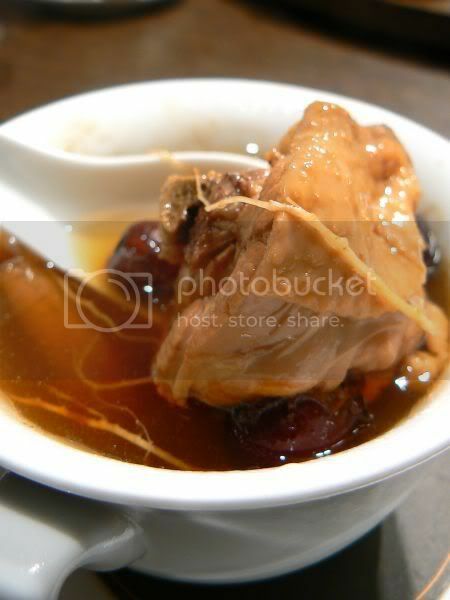 There's not much taste from the plum sauce but the chicken does not need anything else to supplement the juicy sweet taste. As the dishes kept coming, things kept getting better. 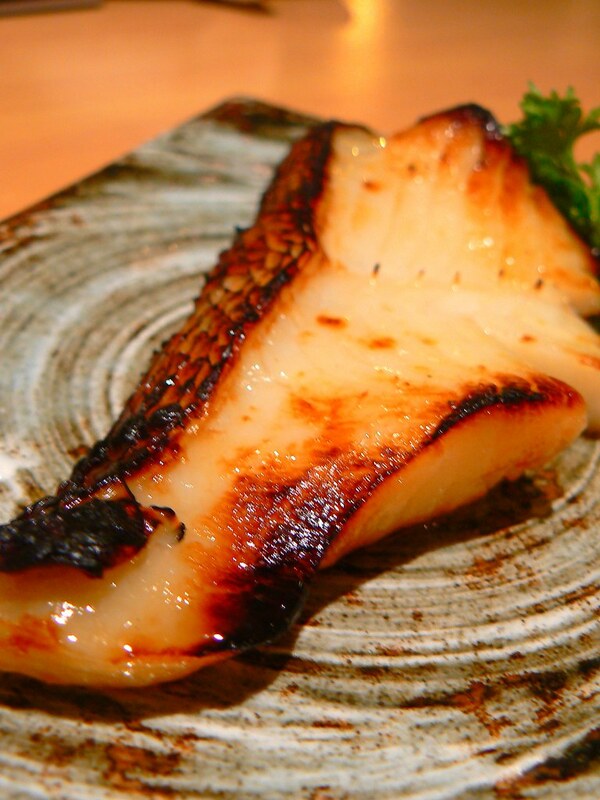 My absolute favourite was their black cod grilled with miso (Gindara Misozuke Yaki). So incredibly fresh, that the flesh has a nice bounce to it and so unlike the water logged frozen cod you get in Chinese restaurants. A quick check with the waitress indicated we had walked in on the right day, as the fish just flew in from Japan. Usually the fish supplies come in Tuesday and Thursday or Friday, so we were lucky to catch this very fresh fish. I also loved their dragon roll. 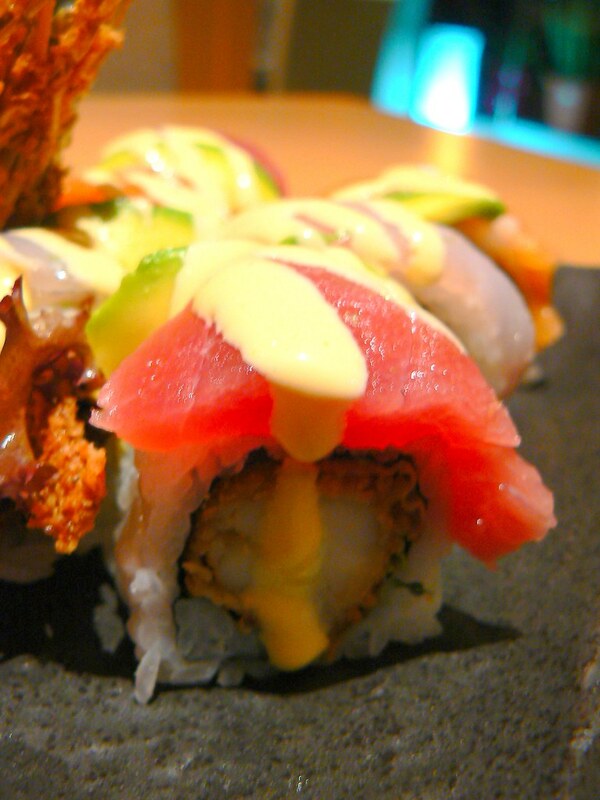 Less rice than the other restaurants, it featured a gigantic prawn within and topped with generous slices of tuna, melt in the mouth avocado and a drizzle of mayonnaise. Weird but I didn't taste any mustard like how she, the epicurious girl mentioned. Maybe they had changed the sauce or toned down the mustard? Instead of rice, we decided to go for the Inaniwa Udon - not bad but not my absolute favourite as I think I would have liked soba instead. I did like the tangy taste to the dipping sauce for the noodles, from a greenish plum sauce. Gave a kick to the plain tasting noodles. 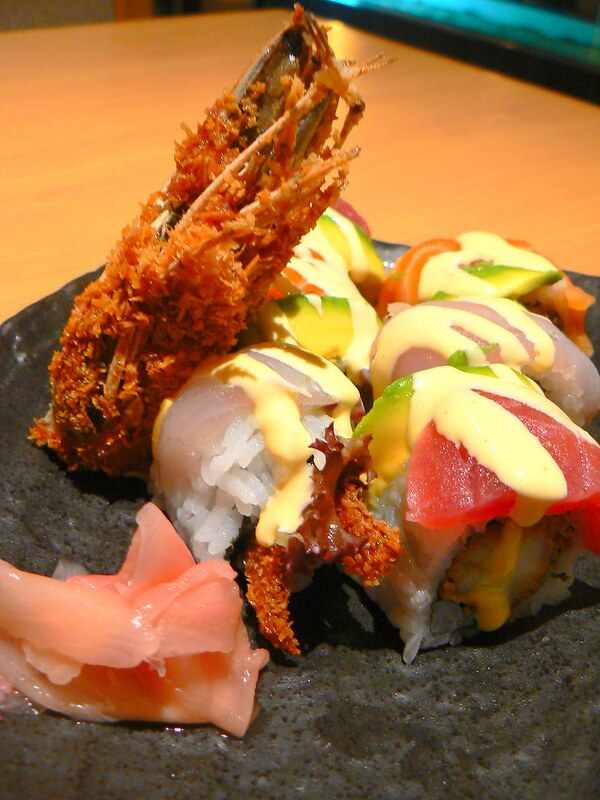 Overall, we were supremely satisfied with the freshness of the fish, chicken and the dragon roll. Will definitely make a re-visit to try the sashimi especially on those days the fish do their fly in from Japan. Post-script (16/4/2008) - I read Jules Eating Guide to Malaysia, he ordered different items on the menu and didn't have a good meal. Do take note, guess not everything on the menu is good. 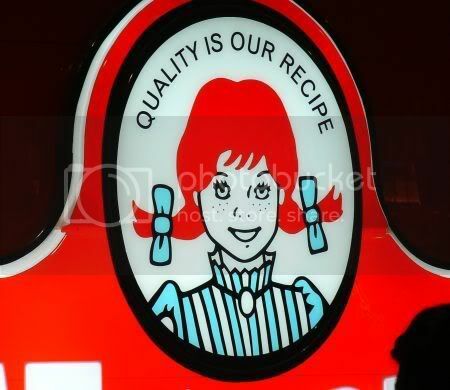 Last night, I finally got some time to check out the new Wendy's at Sunway Pyramid. It has been at the back of my head, that this place has opened but because of work commitments, I only made my way there late last night. Even though it was almost closing time, the place was packed with a queue. Opposite it, McDonalds looked forlorn and empty. We even bumped into an old friend, who also made an effort to come from town to sample the new fast food joint. Owned by Berjaya Corp, they plan to open 10 more outlets this year. Next one is Jaya One, followed by IOI Mall and of course, at Berjaya Times Square where Berjaya has all their franchises housed - Borders, Starbucks, 7-Eleven and Kenny Rogers Roasters. 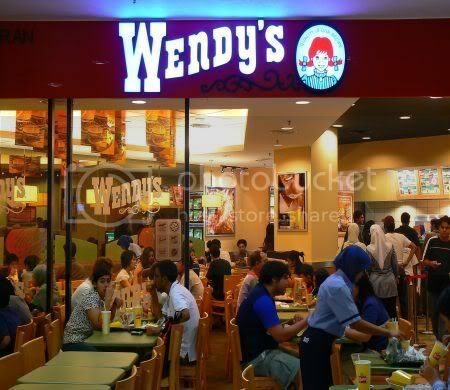 I vaguely remember Wendy's was located at Sungai Wang Plaza. My favourite there was their yummy chocolate milkshakes. So thick and yum! For the franchise in Malaysia, they're serving Quarter Pounders, Half Pounder Double with Cheese and the three quarter pound triple with cheese, fried chicken, fish fillet burger, shrimp supreme burger, spicy chicken sensation, ultimate chicken grill and chicken nuggets. Prices for the burgers range from RM6 to RM15 for the triple while fried chicken is RM6.90 and nuggets are RM5. 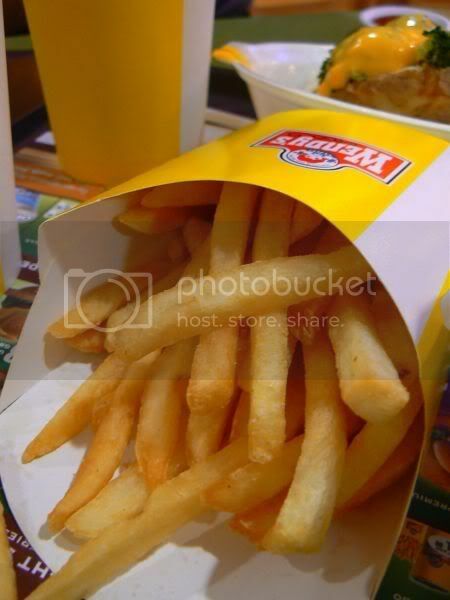 Sets are also available with soft drinks and french fries. They also have their signature sides - baked potatoes with 6 different toppings: butter, sour cream, sour cream and chives, chili and cheese, broccoli and cheese and cheese cheese. Chili is also available - minced beef with kidney beans plus who can forget, their yummy milkshake known as Frosty. They have a few flavours - chocolate, vanilla and twisted versions with oreo and m&ms. The twisted version looks like a Mcflurry. A seperate kids meal is also available. 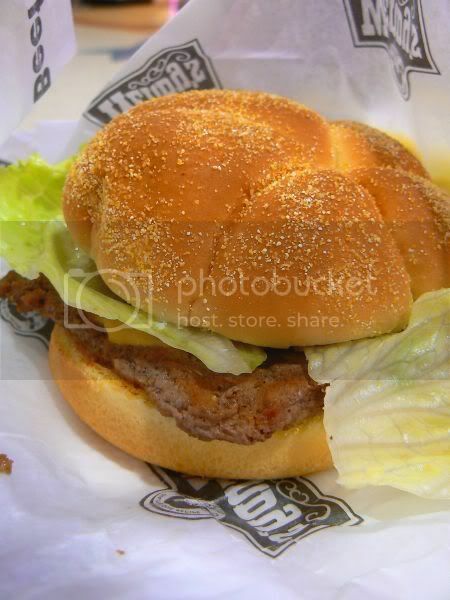 I liked the burger - juicy and square as "they don't cut corners". The bun was soft and quite old fashioned tasting. Said to be made when you order, it definitely didn't taste as it has been sitting in a warmer which is great. 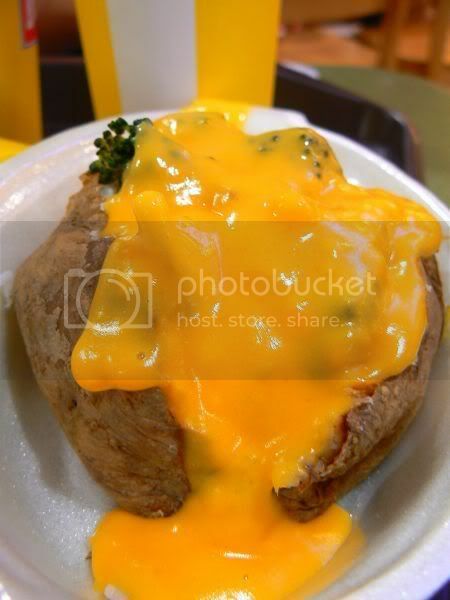 I thought the broccoli cheese baked potato was okay only - definitely not worth a re-order. 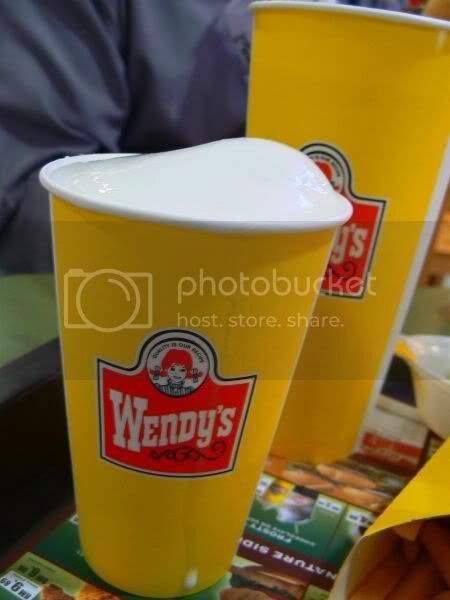 I had great fun dipping my fries in the Frosty. Sadly no chocolate available as it had sold out. Overall, a satisfying meal and we preferred it to Carl's Jr in terms of affordability. The burger is good but a bit basic, the toppings. 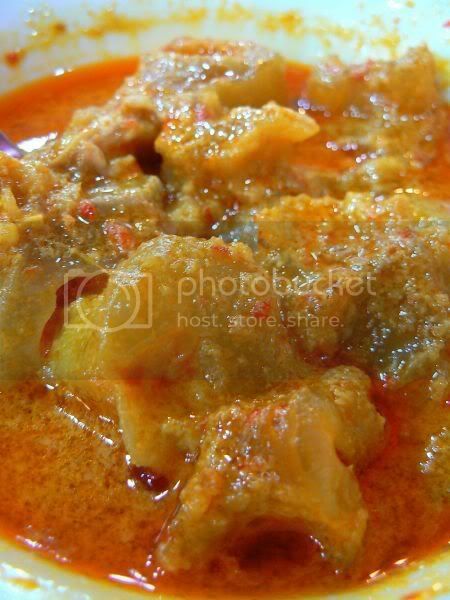 Regular readers will know that I have a permanent love affair with Minang or Padang style food. Discovering new places to indulge in my obssession for this type of food, always makes me super happy. Hence, when I heard whiff of this new place in Damansara Perdana, it was top on my list of "must-dos" last Saturday. Been a while since I got excited about a place for food as I have been dining at regular places. With vague directions of..."it is in Damansara Perdana", we circled the whole block of shophouses. As we reached the last row of shophouses, we were at the point of despair since tummies were rumbling, wondering if we got the directions wrong. Luckily we struck gold at the last row facing Perdana Emerald Condominiums. Hallelujah! We even found a parking spot near the restaurant - a feat as loads of cars double park at this stretch. A basic restaurant, the focal point is the array of food stacked on shelves behind a glass counter, at one corner. Zooming in on the food, we ordered our favourites -tempe, tunjang, dendeng, ayam kampong goreng, bergedil, longbeans and the recommended item, Sambal Hijau. As usual, we got carried away and between 2 of us, we had a mountain of plates fit for 6 people! First bite of the dendeng, got Splashie Boy's thumbs up. After that, it was just an endless silence between both of us, as we filled our tummies with the yummy food. 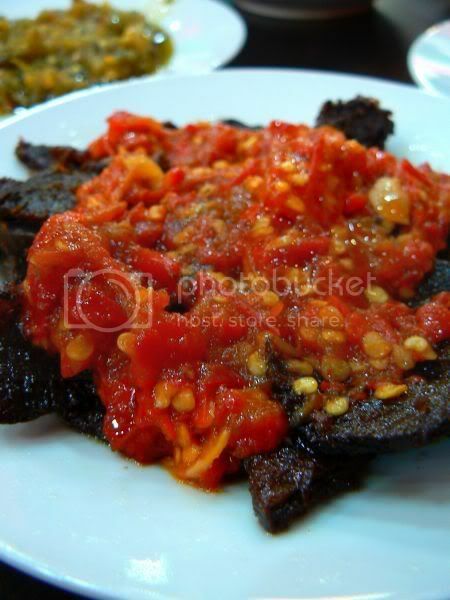 I loved the dendeng, topped with a not spicy but vibrant red chilli sambal. 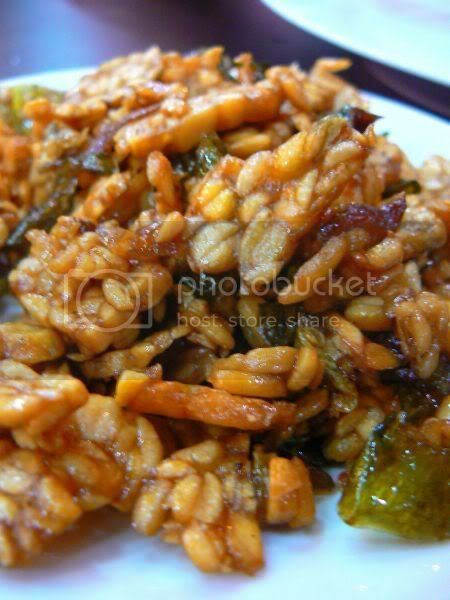 Crunchy and thin, the sweetish sambal went well with the crisp pieces of beef. 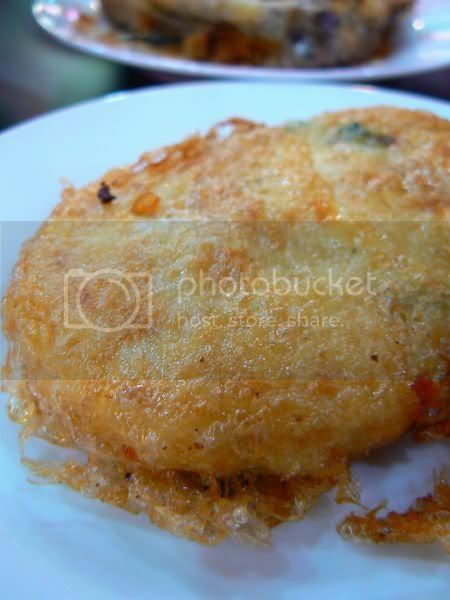 The bergedil - a type of potato cutlet also got Splashie Boy's seal of approval as it had creamy and soft potatoes within. We both loved the tempe - crunchy bits with a sweet taste with fried green chillies for a slight kick and just a hint of tangy sourness. 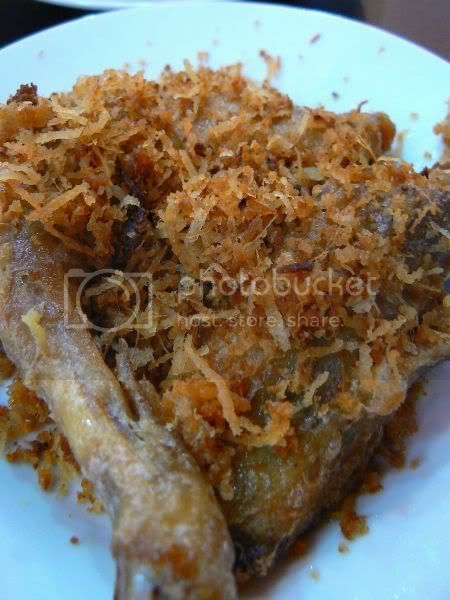 Ayam kampong goreng tasted pretty ordinary but had an interesting topping of fresh coconut shreds. 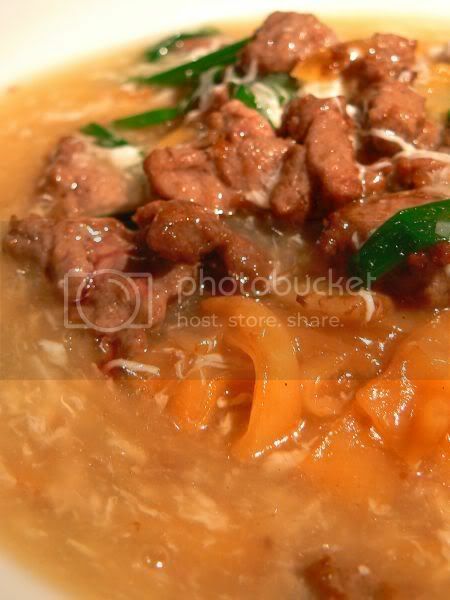 I loved my tunjang - the beef tendons as it was cleaned well plus tender. 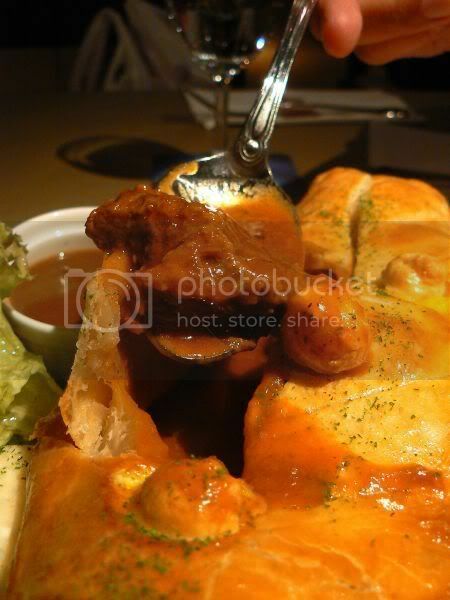 The gravy it came with was also rich and fantastic with rice. 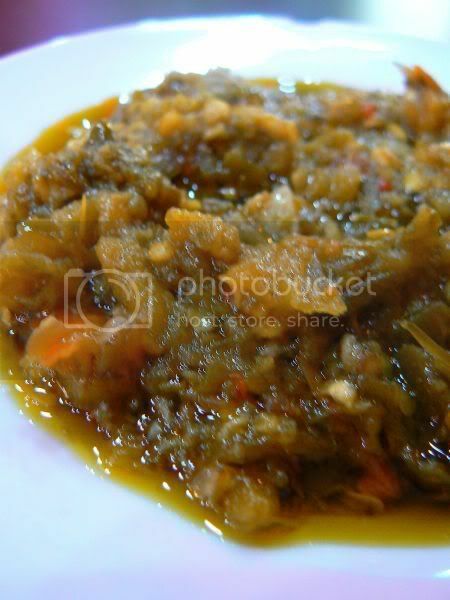 I also loved the sambal hijau - green chillies cooked till tender and sweet. The bill came up to around RM28, including 3 drinks (I was thirsty that day) which was reasonable. 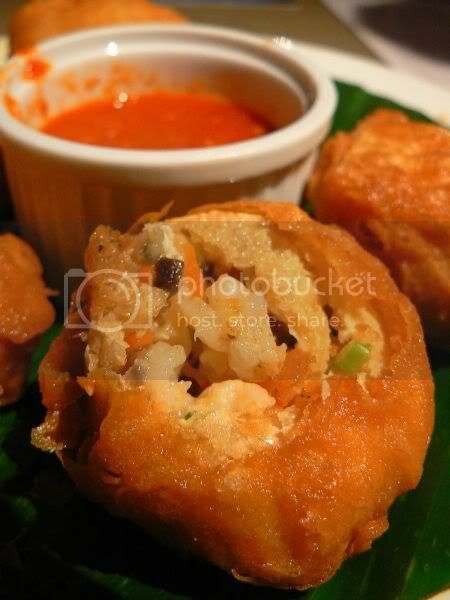 Only thing it didn't live up to its name of spicy padang as the food was not overly spiced but more subtle tasting. Definitely my new hang out place on Saturday for great food. Only bummer is, they're closed on Sunday. Updated: 2 July, 2008 - Seems this place has closed down. So sad, as this was one of the best Nasi Padang places around. Busy! Busy! Busy! Sorry but the blog has been sadly ignored these few days...Nevertheless the eating still continues though. My uncle and his family are down from Hong Kong and China these few days for Ching Ming. We did the deed yesterday - easy and painless as there were no crowds of people jostling for space in the cemetery. Am amazed at how clean the Hokkien cemetery looks now. Almost could not recognise it. We had this last night, since we didn't want to travel too far. My first time trying out the food from Reunion's menu. I love the mirrors, sheer curtains and wonderful lighting - halogen lights that dim and brighten by themself, in the middle of the table. No prices for the food since I didn't get to see the bill. 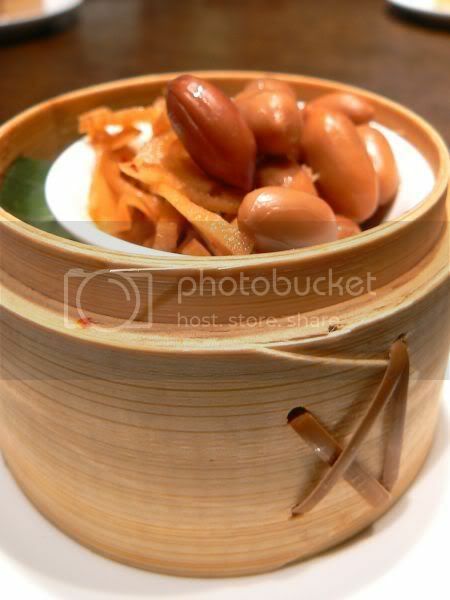 On the table, we had these cute appetizers -a mix of braised sliced lotus roots and peanuts, served in a small dim sum basket. 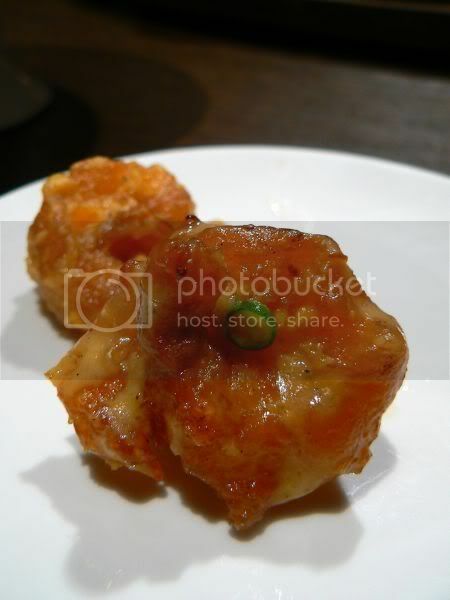 Talking about dainty treats, Reunion has just started serving dim sum for lunch. A small selection, which I wouldn't mind returning to try out. 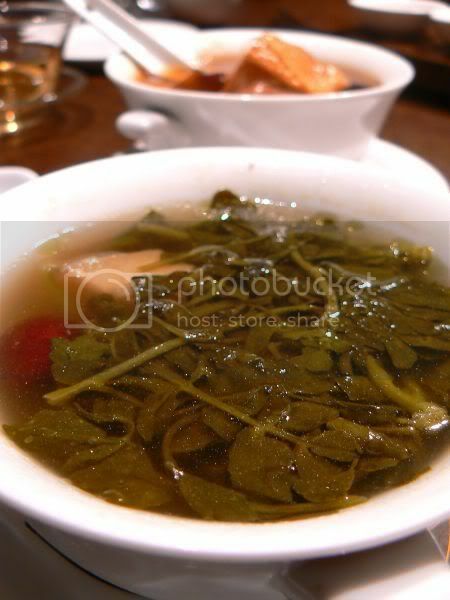 We started out with soups, two varieties among all of us: chicken herbal soup and dry vegetable with pork (sai yong choy tong). Soup was good but I felt a bit oily. Needed just a touch of paper to soak up some oil. The belly pork within the soup was tender. Reunion is said to be famous for its barbequed meats, hence we ordered a platter of suckling pig, char siu and sui yoke (roast pork). Suckling pig was okay, with crispy skin. The char siu was interesting - tender using 3 layer pork. Wouldn't say it was my favourite because I prefer mine with a sticky thick crust and super tender meat within. I liked the sui yoke, with its ultra crisp skin. 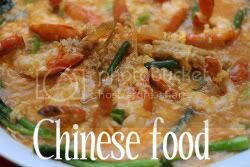 Instead what became everyone's favourite was the salted egg yolk prawns. Peeled so you don't need to mess up your hands, the prawns are dipped in a thin batter and deep-fried. Coated with salted egg yolk, the prawns were crunchy and rich with the creamy sauce with hints of curry leaves and bird eye's chilli. Thumbs up also to the home made bean curd. Smooth with just a bit of spinach, I liked the niblets of minced chicken served with it. 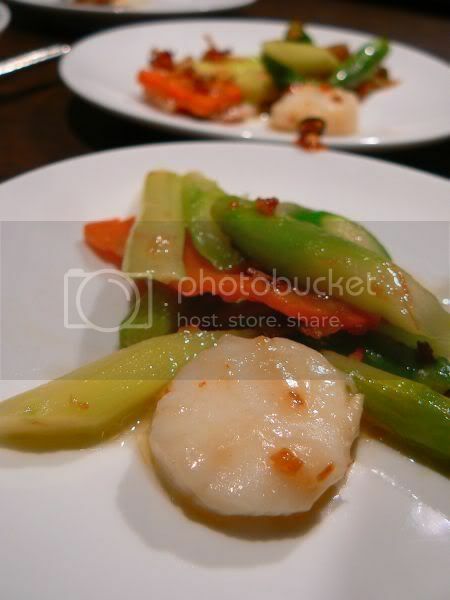 Vegetables (that essential dish for healthy reasons) was a plate of stir-fried asparagus and carrots with scallops. It tasted healthy and I liked the asparagus as they didn't have any woody stems. 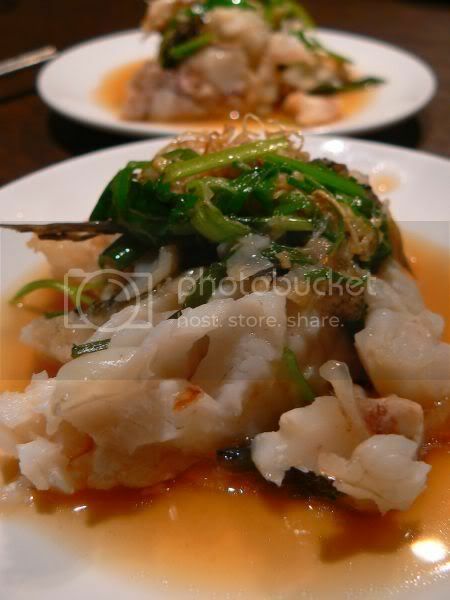 A must when dining with my uncle is the Soon Hock fish, as they don't get it in Hong Kong. 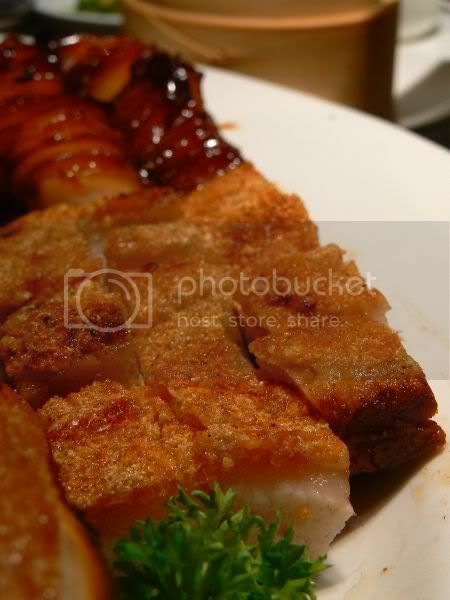 This steamed version didn't come up to par versus an earlier one we had at Overseas Restaurant. Moreover the fish was a bit cold when served. 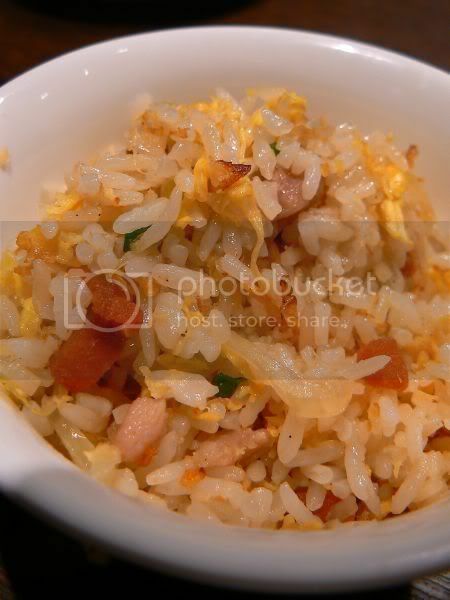 Last but not least, it is fried rice with bits of salted fish and egg shreds. Nice but I ate only a bit as I was full. 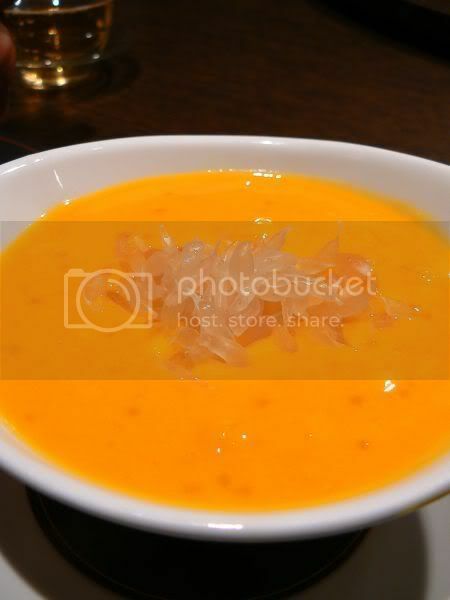 We ended the meal with dessert - the yummy refreshing mango pomelo dessert with chunks of mangoes. Also tried the peanut soup for dessert, which tasted horrible. Not thick like the usual dessert places, this version lacked any peanutty taste at all. We also had fortune cookies, with lots of fun opening it to find our fortunes. Overall, not a bad experience dining here with some hits and misses. Service is also pretty prompt as we sat in the private room. I'm on the roll, this week with my second post in two days. Hopefully I can keep this up! Happy April Fool's day everyone. Do get up to loads of michief and play funny tricks on your fellow colleagues or friends. Seemed appropriate, I should post this today - the day of WIP's official opening. Sadly, I doubt I will be attending since I'm busy with training at the mo. 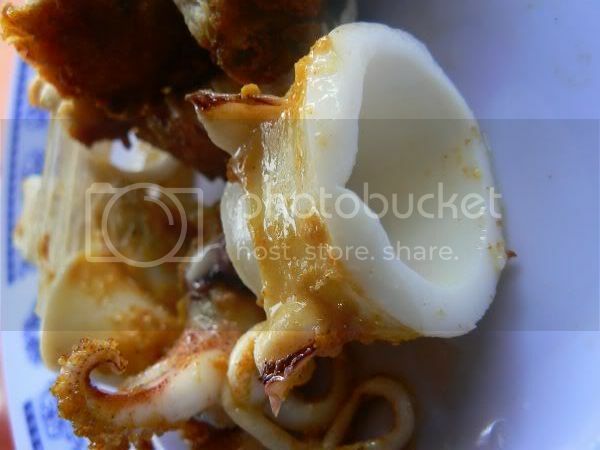 Nevertheless, I did get a preview of the food (finally! ), last week when we dropped by for dinner. As everyone knows, the people behind WIP are Fred and Michelle, the same ones who own Souled Out. That place used to be my absolute favourite place to hang out with friends and the defacto celebration place for our office events. However, as that place got more and more popular, it became a pain to get a table there, when we felt the impromtu need to drop by. Hence I was excited to discover this new joint. Serving the same type of food, I preferred the ambience here versus Souled Out. Decked to resemble a work site, with black and yellow tapes, my favourite part were the wait staff. They're all dressed like workman, with overalls and t-shirt in yellow and brown. I especially like the torch perched on their heads. The place is also more cosier than Souled Out, with less of a crowd. Foodwise, it was average. I reckon they could have done better with my Beef Kuey Teow - eggy gravy with little taste. I loved this cute stuffed Tofu Puffs they had for snacks. Perfect for those waiting for their pie. Splashie Boy had the famous Paddy's Pie - very good stuff with chunks of beef in stew. Overall, I enjoyed myself and wouldn't mine returning again for another meal.